Our Culinary Herb Garden, located between the greenhouse and the fields, is full of flavors to enhance your cooking. Sara, our herb gardener, will be sharing information throughout the season about harvesting and using the many varieties of herbs we grow. In general, the herbs in the culinary garden are available for you to pick yourself. As with other pick-your-own crops, they can be harvested on the day you pick up, or one day later. All herbs are labelled and any herb ready for harvest will have a yellow sparkled star placed at the front of the bed to indicate that it can be picked. Please only harvest where you see the yellow stars! Whether herbs are ready for harvest depends on a variety of factors, and all herbs will have their chance during the season. Our perennial herbs that are ready to pick this week include chives and their flowers, lovage, marjoram, oregano, savory, and thyme. Chopped chives and chive flowers go well in salads or as a garnish for eggs or dips. 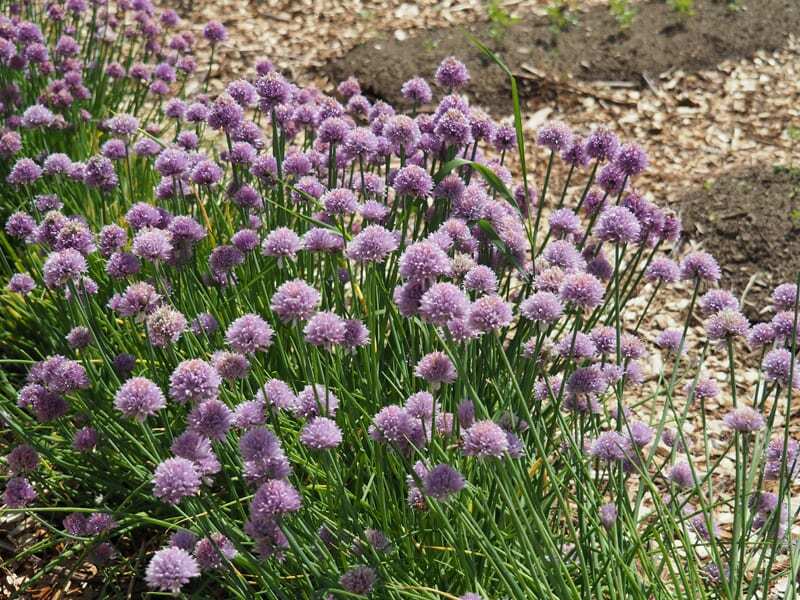 Chive flowers also make great butters or vinegars. Lovage is among the first herbs ready to harvest. It is excellent in soups and stews. A little goes a long way, and it freezes well for future use. Marjoram has a scent and flavor similar to oregano and can be used as a milder substitute. Marjoram aids digestion. It can also help protect against common illnesses, reduce inflammation and relieve stress. Try it fresh or dried in soups, sauces, salads and stews. Oregano has a strong aroma like sage and thyme, with a warm pungent taste. It has strong antiseptic properties and it is highly potent as an antibiotic as well. Savory, fresh or dried, can be used in cooking and for medicinal purposes (it relieves indigestion and other digestive upsets). Use it to flavor vinegar, butter, beans, salad, soup and tea. Include dried savory leaves in potpourri. Thyme has a piney and peppery taste with bitter, slightly lemony and minty notes. It is at home in Mediterranean dishes and pairs perfectly with fish, chicken, beans, tomatoes, lemons and wine. Thyme has been long known for its antiseptic properties and can relieve head and chest congestion. It has been used as a gargle to relieve sore throats and mouth ulcers. As when harvesting any plant, picking herbs requires care in order to preserve them and enable them to continue to grow. Follow these instructions to harvest your herbs while ensuring the plants remain strong and keep growing through the entire season. Please always use scissors to cut a small amount from each of several different plants (we’ll have two pairs of scissors on hand, but bring your own so you are sure to have a pair available). Snip individual stems no more than 1/3 of the way toward the bottom of the plant. Think of harvesting as “giving the herbs a trim” so you are always leaving plenty of the plant behind to keep it healthy. Never pull or tug at herb plants with your hands; you might pull out the roots with the stem and prevent the herb from growing more leaves. The herb garden will be open frequently so you can pick fresh. Please only harvest what you can use in a given week. If you’re hoping to dry your herbs for the winter, pick a little every week so that over time you collect enough while still leaving fresh herbs for everyone to share. If you ever need assistance or are unsure about how to pick a herb please ask a farm staff member for help. We look forward to to meeting you in the Culinary Herb Garden!